4 Way DC Power Splitter Lead. 2.1 X 5.5mm Socket to 4 DC 2.1 X 5.5mm Plugs. For splitting low voltage from one power source to 4 units, ie CCTV cameras. Can record in Analogue High Definition plus IP and also supports older cameras. Easy web connection via app to mobiles, laptops, computers etc enable viewing anywhere in the world. Can use any Browser, not just IE. Built-in IE plug ins, no need to install from CD. Preview, recording, playback, backup, network live, mobile phone view. All operations are independent of each other. Simple Playback with Normal, Speed Play, Manual and Single-Frame Play - easy time-bar facility. Easy backups to USB stick, portable HDD or over the network/internet. 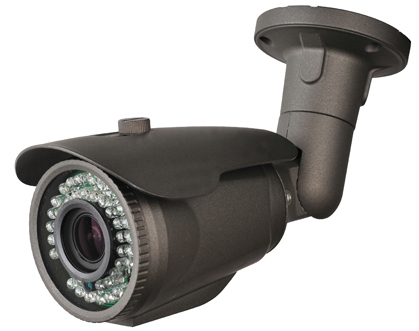 With a 2.8-12mm Lens and Wide Dynamic Range this Weatherproof Camera is ideal for facial recognition. The Night Vision and strong Anti Vandal metal case allows it to be used in almost any situation even where the camera is positioned in harm's way. A high quality 3 Megapixel Varifocal Lens assures the best possible images in all lighting conditions. Excellent images in daylight and total darkness, up to 25m. Can be set for detailed close-up images or very wide angles. Wide dynamic Range (DWDR) covers a wide range of lighting conditions. 3 Axis Bracket inside.